A cairn erected over graves commemorates those who perished when the "Walter Hood' was wrecked in 1870. The gravesite contains the remains of those victims who were originally buried near the beach. The memorial and reserve was opened on 9 March 1927 in the presence of a survivor, Robert Williams. It incorporated ceramic tiles from the wreck and a marble tablet listing the names of those drowned, made in Wollongong. The memorial today is in much the same condition, but protected from vandalism by a steel mesh fence. The land is administered by the National Parks and Wildlife service. On April 20, 1870, the ship Walter Hood, of more than 900 tons register, when on its way from London to Sydney, became a total wreck near Red Head, between Jervis Bay and Ulladulla. Eleven persons lost their lives, including Captain Latto, one passenger, and nine of the crew. Ten persons were saved by swimming ashore, and 13 were rescued on April 30 by the steamer Illalong. Wooden slabs, ornamented and suitably inscribed, were erected to mark the graves of those who were lost and buried close to the beach. 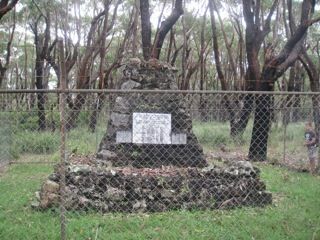 Time and bushfires have reduced these tablets to a very dilapidated condition, and the residents of Red Head and Conjola have recently succeeded in raising sufficient funds to provide a more permanent memorial to mark the resting place of these shipwrecked sailors, and on March 9 there will be unveiled a cairn, built of stone 14 feet square at the base and 13 feet high, and bearing a marble tablet, on which have been inscribed the names of those who lost their lives just upon 57 years ago. It Is expected that one of the sailors who was the first to swim ashore will be present at the unveiling. Two young men, John Harrison and the late S. S. Balley, who were visiting Milton nearby at the time of the disaster went to the locality and tried to swim out to the wreck to bring a line to the shore, and Mr Harrison, who succeeded in bringing a line half-way back when it broke, hopes to be present at the function next week. The Sydney Morning Herald (NSW), 4 March 1927. The Walter Hood left London on 22 January 1870 carrying beer, iron bars, railway irons, cork, cement, wine, salt and theatrical costumes and a large quantity of tiles. The vessel encountered a heavy storm when turning up the eastern coast of Australia. The gale stripped the vessel of sails and carried away Wilkie, a seaman who was to be the first of many casualties. On Tuesday 26 April, land was sighted amidst mountainous seas. The Walter Hood, in a crippled state, did not have enough canvas left to beat out to sea. The Walter Hood struck a reef in Wreck Bay and immediately began to break up. Fearing certain death on the collapsing deck, members of the crew attempted to swim to the shore. Those remaining on the wreck, many of whom could not swim, watched helplessly as their companions drowned. While some eventually made it to the shore, others died from exposure on the hull. Captain Latto was washed out of his cabin and drowned amidst the wreckage of his ship. The thirteen remaining on the exposed stern had now been without food for three days and nights. In desperation they killed a small dog belonging to their dead Captain, ate its flesh raw and drank the blood. The passing steamer Illalong was directed to the scene and the 13 survivors were recovered in a desperate state. The bodies of those drowned washed ashore and were buried in a suitably marked spot in the bush. TO THE MEMORY OF THOSE DROWNED BY THE WRECK OF THE "WALTER HOOD"
CAP. ANDREW LATTO AGED 37. JOSHUA ROLEY HAYES, - PASS - AGED 19.